With Thanksgiving and Christmas right around the corner, people all over Westbury and Long Island are making preparations to travel for the holidays. It’s a lot of work to transport a carload of family or friends from point A to point B, and it can be tough to keep your sanity in check, not to mention keeping your Toyota in pristine condition. But what happens when you throw a pet (or two, or three) into the mix? Here at Westbury Toyota, we understand how important it is to be able to not only travel safely with pets during the holiday season, but to also be able to drive in a stress-free, clean environment. If you’re wondering how to make your holiday commutes a little easier for every person - and animal - involved, check out the tips we’ve put together on how to make long road trips easy, safe, and neat for you and your four-legged friends. Pet hair is just a fact of life for pet owners. However, not everyone enjoys having the interior of their vehicle covered entirely in pet fur. If you’d like to make a long trip without having to vacuum for hours afterward to get your car back to the way you prefer it, it’s time to think about getting some seat covers. Once the trip’s over and you’re back home, all you need to do is remove the covers and your seats beneath will be hair- and dirt-free. As an extra bonus, seat covers are easy to remove and clean, making them super practical for long road trips when you’ve got your pets in tow. If you’d like to confine the mess that’s inherent with owning pets to one part of the vehicle, it might be a good idea to look into buying some pet crates designed especially for traveling, as Amy Sinatra Ayres of VetStreet.com explains. You can fit them into the back of your sport utility vehicle (SUV), or van (or, with a smaller pet and crate, the back seat of your car). Your pets can then travel in the crates during the trip (with frequent stops to let them out to exercise, of course! ), which will restrict how far their hair, dander, and dirt can spread. In addition, crates can limit driver distraction by reducing how much a pet can move around in your Toyota, which means it’ll be a safer trip overall for everyone involved. Pre-packaged food, enough for multiple feedings. It’s best if you use familiar food for a long trip instead of trying something entirely new. If you’ll be hauling around more than one pet, make sure to label which food belongs to which pet to cut down on unnecessary confusion. Veterinarian documentation for proof of all your pet's shots/medications in the event that something goes wrong along the way. A litter box and extra litter if you are travelling with a cat or cats. Toys and treats to keep your pet’s mind off the trip, and to reward them for good behavior. Collars, IDs, and tags so that if your pet gets away from you, others can easily identify it and contact you. Enough water for the trip, carried in resealable containers (or, alternatively, you can stop to get water along the way). 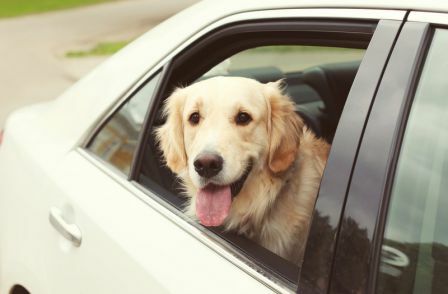 Having these items on hand can keep your pets happy, healthy, and entertained, which in turn will make the long ride easier on you and your other passengers. The holiday season is about celebrating with friends and family, and that’s why it’s so important to travel safe and smart during those long holiday road trips. Many of our staff at Westbury Toyota travel with pets and know the do’s and don’ts, and we hope the tips we’ve listed here will work as great for you as they have for us. You don’t want to spend hours driving in a car full of miserable kids and pets, so taking the time to ensure that you’re as prepared as you can be can go a long way toward improving the mood of everyone, person or pet, in the car. By eliminating unnecessary, unwanted messes and focusing on your animal’s mental and physical health, you’re guaranteeing a smooth and safe ride from Westbury and Long Island to wherever the holiday season ends up taking you!